Fiction – paperback; Overlook Duckworth; 236 pages; 2004. Translated from the Swedish by Tom Geddes. 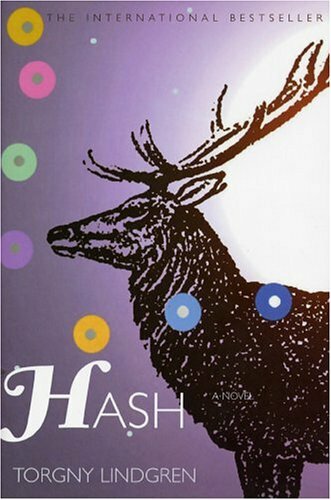 Hash is one of those kooky, surreal books that plays with your mind. The author, Torgny Lindgren, is a prize-winning author from Sweden who currently sits on the panel which selects the Nobel Prize for Literature. His books — and there are lots of them — have been translated into more than 25 languages. Sadly, only a handful seem to be available in English. Swedish hash, pölsa (dial. pysla or palscha). Dish comprising finely ground meat, usually offal, in its own jelly. Minced meat. Originally bulscha, from the Greek balsamon, deriving from a Semitic word denoting a viscous mixture of resin and fragrant volatile oils (see Balsam spruce), thence balsamic. The story has an unusual twist, however. Well, a couple of unusual twists, if I am honest. The first is that the travelling salesman, who calls himself, Robert Mazer, is possibly the fugitive Nazi Martin Boorman. Mazer claims to have no memory, but tells everyone he is a “refugee from war-torn Germany” and that he was raised in the district of Mecklenburg. “For some time now after tactful inquiries from perplexed and concerned readers, we have carried out careful investigations into the veracity of the reports you have submitted over the course of the years, the all too many years, which we have published conscientiously, honestly and fearlessly. This letter is crucial to the rest of the book, because it plants a couple of seeds in your mind that ferment as you read further into the story. One of those seeds is this: is our narrator reliable? Is what he telling us the truth? Or is it all fabrication? Another seed: does this 107-year-old man even exist? This is what I mean about the book playing with your mind. It’s very post-modern in that sense, and it’s also highly reminiscent of American writer Paul Auster, not necessarily in prose style, but definitely in structure and subject matter, right down to a character named after the author popping up, albeit very briefly, in the storyline. Torgny’s novel, much like anything that Auster writes, is obsessed with the notion of story-telling, memory, truth and reality. How do we know these things happened, and is it actually important? What is memory? Does truth exist? But Torgny’s approach is slightly different: he’s not afraid of humour. There are some dark comedic moments scattered throughout this novel and some of his commentary, particularly about old age and council funding, is quite biting. Hash also has a touch of Gothic horror about it, because most of the action takes place in an isolated village ravaged by highly infectious turberculosis. Relationships, in whatever shape they might take, can be deadly. This is the type of novel that will appeal to readers who like postmodern literature, complete with trademark metafiction and unreliable narrators. But do beware that the book is richly littered with descriptions of offal, including its taste and texture. The warning is in the title. Finally, thanks to Philip Young from Scoop! Journalists in Fiction and Mediations for tipping me off about this one. I am betraying my lack of intellectual credentials here, but I have to admit I read half or one-third of this a few years ago and had to put it down – I could not follow it and found it very boring as a result. A limitation in me rather than the book, I am sure. I can understand why you had trouble following this book — it’s far from a straightforward narrative. I don’t particularly like postmodern fiction — for instance, I HATED “If on a Winter’s Night A Traveller” because I could not follow it and thought it pretentious waffle. But I do like Auster’s work and Torgny seems to fall into the same camp, but with more comedic elements. Thanks for the link to Frank’s review. I love the headline “offally nice” – such a great pun for a book about Swedish hash meat! You have me intrigued — particularly on the 107-year-old reporter angle. Excellent discovery, I’d say. I love the quote questioning all of the stories that he has written. I did think of you when I read this, Kevin. It’s not really a book about journalism, but there’s enough references to classify it as a “journalism novel”. It poses some interesting questions about what is truth, which is essentially what journalism is all about — seeking and reporting the “truth” — as well as looking at the blurring of lines between fact and fiction. Glad you liked the quote — it comes very early in the book and made me laugh out loud. Some of the reports he made up, in particular the “The dramatic week-long struggle to rescue an elk from Hölback marsh”, were just preposterous! Do you mean Peter Carey’s Illywhacker?? If so, I tried to read that novel about 15 years ago and failed dismally. Maybe it’s time to revisit it? Haha… Yes, you might find this a bit stomach-churning. I don’t eat red meat and I certainly wouldn’t touch offal with a 10-foot barge pole, but somehow I was able to distance myself from what they were eating. I actually found some of the descriptions of the meat quite hilarious, because he goes into great detail to describe something which is basically just grey and spongey! As it happened the book arrived yesterday. I will admit that I have been avoiding it. I was supervising Canada’s largest news agency during the genocide and I’m afraid there was just too much reality for me to want a fictional account (and I heard too many Romeo Dallaire speeches). Now that we are a few years on, I am ready to give it a try. Hmm… sounds interesting. Offal doesn’t put me off but ever since If on a Winter’s Night… post-modern does pleb that I am. Hehe, well, I hated If on a Winter’s Night, too. But Torgny’s book is MUCH easier to understand and follow and nowhere near as pretentious. This one sounds great. Excellent review, too, by the way.